I can't tell you what makes the perfect burger. I doubt anyone can. In my estimation the burger has become a tabula rasa, much like the pizza, a blank sheet of possibilities, many of them deeply satisfying, some dubious and still others downright criminal. It is after all a delicate balance between finding flavours that enhance the burger itself and excluding those that drown out its friendly familiar meatiness. Walking around town you'll notice a fair few burger places have opened up claiming to offer a gourmet or bespoke burger experience. Trying to elevate it to a near fine dining. They are usually the kind of places that will serve you your chips/fries (please delete according to cultural preferences) in a metal paper lined cup thingy or giving in to some retro chic food designer and serving them upon delicately cut pieces of newspaper. There will usually be some sort of Moroccan lamb burger on the menu too. Whilst I appreciate the effort and I've eaten some perfectly fine examples in these kinds of places, they lack something. They seem sterile and forced. It is not a burgers natural habitat to be eaten amongst dark wood, white walls and trendy lighting. Excluding those furtive visits to those chain burger "restaurants" that shall remain nameless and result in nothing but a feeling of shame akin to the kind fostered by the Catholic Church, there are only a couple of natural habitats for the noble sandwich. The first is at home, where making them is as ritualistic and dogmatic as the aforementioned Church of Rome. The other is wherever there is noise. I'll probably have to elaborate here. Think a football match, a busy diner at lunch time, the burger joint on the way home from the pub, wherever you'll hear the sound of bowling bowls hitting pins. Where ever there is bustle and a touch of testosterone in the atmosphere. A waft of grease in the air, not that bizarre plastic smell you get in the massive burger chains, but the smell of real meat being grilled. The quality is almost an aside. 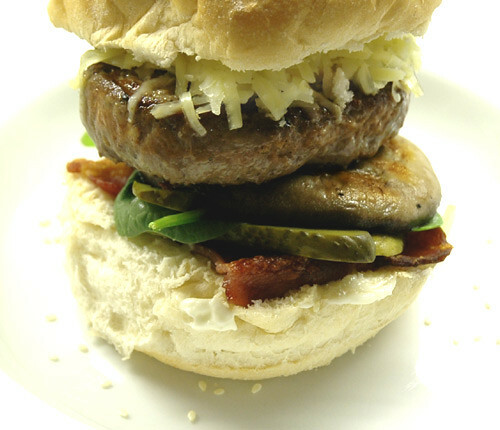 If they make a quality burger from carefully sourced local suppliers that that's brilliant. If they are grilling them up to next the doners and shish in your local open-till-4am mystery meat kebab shop or and you're a bit pissed or you're in a queue for the burger van outside a football ground, the quality may be a bit suspect but at least you are in the right place. Probably the exception that proves the rule. This is a rather nice cocktail bar with a supposedly upmarket diner and 3 bowling lanes attached and deeply trendy (or probably was a month ago). A nice solid burger experience, with tables looking down on to the lanes. A big '50's Americana vibe and a smattering of Big Lebowski chic. We ordered White Russians. Football grounds are not known for their gastronomic excellence, unless you count Roman Abromavich's exclusive Nobu take outs for his guests at Chelsea home games which run to £5000 a pop. This burger was everything you'd expect from a football ground, slavered in ketchup and sticky cooked onions, walloped down quickly to get back to our seats in time for the second half. Bubba Helburg barbecues in Spitalfields Market. Noisy, a bit spartan, but hell, the man can cook a mean burger, not to mention the ribs would be a crime. At home the burger becomes something rather different. The whole enterprise slows down and familiar patterns and rituals take place. From the mix of your burger patties to preparing garnishes it is a deeply satisfying experience and I enjoy the vehemence with which people defend their own particular inclusions in their burgers. Australians and Kiwis tend to wax lyrical about a thick slice of beetroot. Quite a few Brits will go misty eyed about the patriotic inclusion of bacon and a fried egg. Arguments rage for days about pineapple. Most people agree on the basic principle of cheese. Fights may break out if it is blue cheese. UN peacekeepers are called when Onion Ring in the Burger are brought up. Me? A large field mushroom is a must. The warm sweetness of the meat and the dusky autumnal tones are a singular match. Couple that with the sharp tang of gherkins and mustard and you're near burger perfection. The only burger I ever had in London was at the GBK in Hampstead. Can't actually remember it though. Here, I am lucky enough to live near the In-and-Out Burger! And as you know, those are good burgers, Walter. I had a grilled sardine burger with red onions and a squeeze of lemon today. My ideal burger seems to get simpler every year. Where once I wasn't content without both bacon and cheese (not to mention the occasional additon of sauteed mushrooms, barbecue sauce and avocado), I've lately become downright spartan, if remarkably specific, when I make them myself. I like six ounces of ground beef (half sirloin, half chuck), seasoned with only coarse salt and pepper, cooked for 3 minutes per side in a blazing hot cast iron skillet, on a soft toasted bun, with spicy mustard, raw red onion, and a thin slice of pickle. If I'm not making it myself, it's In-and-Out all the way. That posts needs major editing. Too convoluted for the sake of being too convoluted. Were you talking about burgers?